"This is a very simple meal to make. You just throw everything in the crock pot and let it cook during the day. 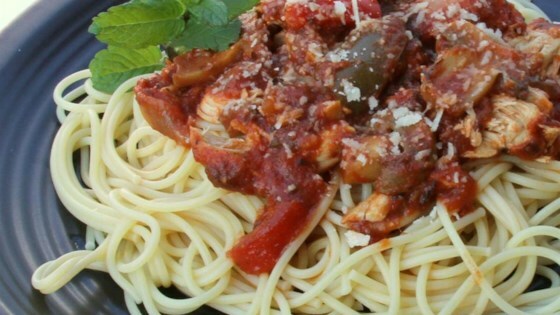 I like to serve this over thin spaghetti (especially garlic and herb thin spaghetti when I can find it)." Substitute fresh mushrooms with canned, sliced mushrooms, if desired. My family loved this! The chicken was so tender and juice it was incredible. Not everybody in my family likes mushrooms so I held them out and sauted them in butter and red wine. I added fresh basil. I didn't find it bland at all. My only complaint would be the chicken was a touch dry. I would reduce the cooking time to avoid this problem.